Manly was His virtue. Steady was His gaze. "Who is this that even stormy wind and sea obeys?" Heavy was His burden. Rugged was His way. It hurts to know my sins increase the price He had to pay. In full, indeed. He paid it; now I can be free, to live the Life He carefully selected just for me. I know it won't be easy. I'll feel the push and shove. He, too felt it, so I'd feel the power of His Love. I wear a Rugged Cross to show His love is tried and true. He's won the fight and earned the right to tell me what to do. Now when I'm tried and tempted I'll remember, He is Boss; and lovingly remember He, too, wore a Rugged Cross. Cross Measures 13mm (1/2") by 17mm (5/8"). Approximate gram weight is 3.11 grams in a size 7. Weight varies by size. 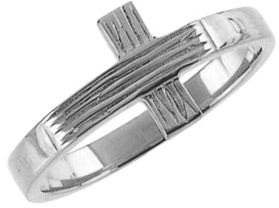 We guarantee our Women's Rustic Cross Ring in Sterling Silver to be high quality, authentic jewelry, as described above.